Your One Stop Design and Printing Shop. 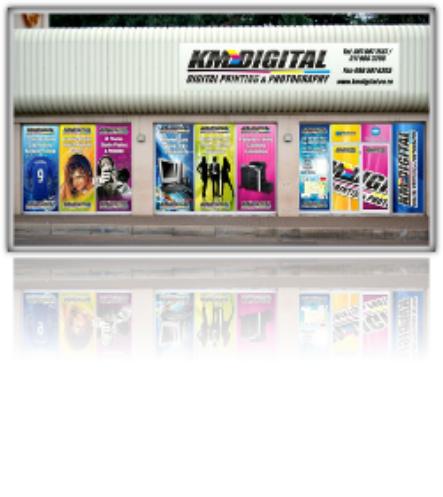 K M Digital Vosloorus JHB has been in business since 1993 and is a proudly South African company. We started off as a small business specializing in photo printing with a staff of only 3 and have now grown to a renowned one stop for almost any form of printing, signage and photography with 12 well trained and qualified staff to help you personally at our walk in branches. Situated just out side of Johannesburg we are ideally situated to service clients from all walks of life, from the suburbs of Vosloorus & Katlehong to clients from central JHB, Alberton, Boksburg & Germiston. There is no order too big or too small! Our vision as a printing company is to add value to people and businesses by building long lasting relationships with our clients and to create a positive environment for clients and employees to succeed in everything they do. We strive to create partnerships with our clients and suppliers so that we can see businesses enriched and grow continuously. Our services include but are not limited to Signage, Screen printing, Large Format Digital Printing, Booklet Printing and Finishing, Label Printing, Canvas, Posters and Banners. We have been in business for more than ten years and have qualified and experienced staff members who always go out of their way to do the best work they can do in the best time. Send us an email or give us a call with the specs of the job you need done and let us get it done for you. With our awesome turn-around times we will be able to get your job done in record time, and with our well trained staff and award winning graphic designers we will give you the upper hand over your competitors.